Half of the Mass. Ave Bridge was shut down as workers tried to fix the situation during the busy commute. By Steve Annear·	 6/18/2013, 5:57 p.m. Motorists on their way home from work were asked to exercise “healthy levels of patience and caution” after all the traffic lights in the South End went out combined with a power outage along Massachusetts Avenue near the bridge toward Cambridge. 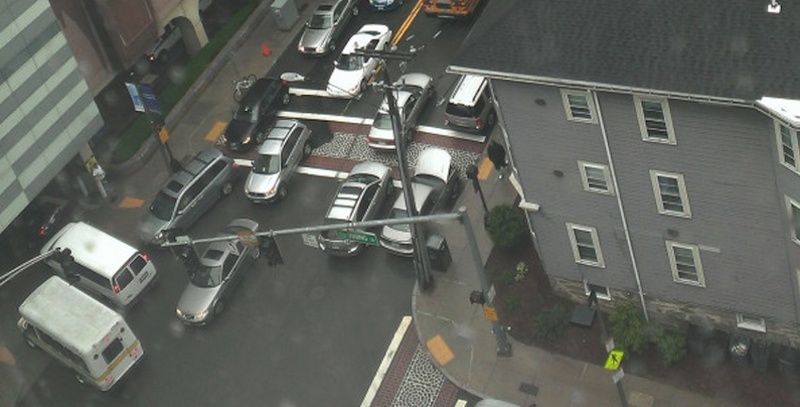 Boston Police said workers from the city’s Department of Transportation were trying to fix the “malfunctioning signals,” but as they were working, drivers began gridlocking the streets. Police said motorists trying to pass through intersections where the lights were down were “worsening” the situation. According to Massachusetts State Police, traffic coming from Cambridge into Boston was diverted, and drivers were asked to instead take Memorial Drive due to the number of vehicles clogging the streets on the Boston side of the bridge. Two State Police patrols were set up at the Massachusetts Avenue Bridge to initiate the detour. Troopers and Boston officers responded to various intersections to alleviate the traffic jam, police officials said. To make matters worse, a short time after the lights went out, leaving drivers without clear direction, a truck struck the railroad bridge on Soldiers Field Road heading inbound, which lead to a complete shutdown of that section of the roadway at Western Avenue.